It was heartbreak in Assen, Netherlands for Dutch rider Bo Bendsneyder as his 10th place finish was given a DNF. A last lap kurfuffle with another rider on the final chicane resulted in Bensneyder being ejected from his bike as he slid across the finish line. Apparently this is against the rules. Lame. Bendsneyder was in the front pack for most of the Motul TT at Assen’s 22-lap race. A quick glance at the official lap results shows that the lead pack of 10 riders had less than a second between tenth and first place. 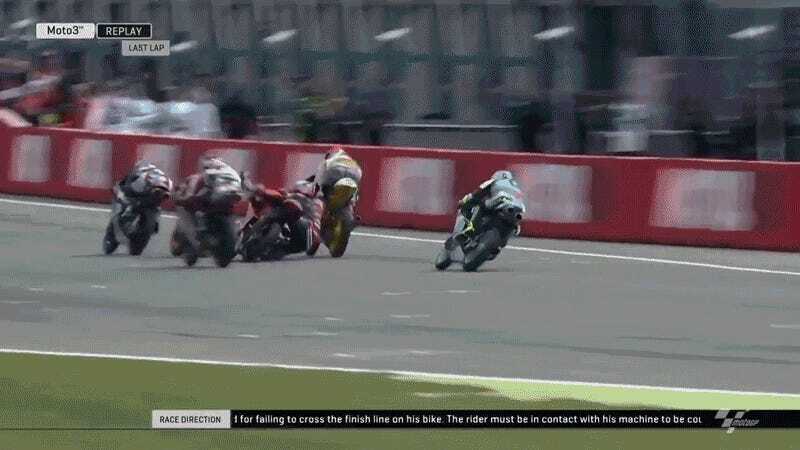 And as the video shows, every one of those riders was fighting for points. For Round eight, Bo was the only other Dutch rider in the field as wildcard Dutch rider Ryan Van de Lagemaat dropped out around lap two. The pressure was on for the 18-year old to bring a little national pride with a strong finish. But the Dutch are a friendly people and recognized the effort of the young rider as many sent their warm regards, words of encouragement, and well wishes on his next race in Germany on twitter. Currently Bendsneyder is 17th in points and has a lot of catching up to do in the next 10 rounds. But with a points available for riders up to 15th place and a first place finish garnering a whopping 25 points, the pecking order of standings is still in the air.